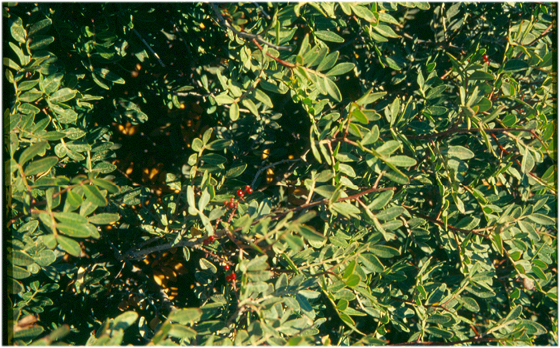 The lentisk (Pistacia lentiscus) is a typical plant of the shrub. It is an evergreen shrub, measuring up to 3 metres tall (rarely 6-8 metres), giving off a heavy resinous scent. Its leaves are composed of 8-10 (6-12) pairs of oval, leathery and glossy leaflets. Its flowers are small, red-brown or yellow in colour. Its drupes, which are the size of small peas, are red, then they turn black when ripe. A resin is extracted from its trunk by letting it flow out of cuts in its bark; it is used as a resin to chew or as a sealant. Its wood is excellent as coal fuel. The oil extracted from its fruit is used as lamp oil or in the food industry.